Vinyl shake siding prices range from $4 to $8.50 installed per square foot. This is considerably more expensive than horizontal lap, although often times, shake or shingles are only used on smaller portions of the home for visual accents. They look really great when properly used and can work with brick or stone cladding for a stunning effect. 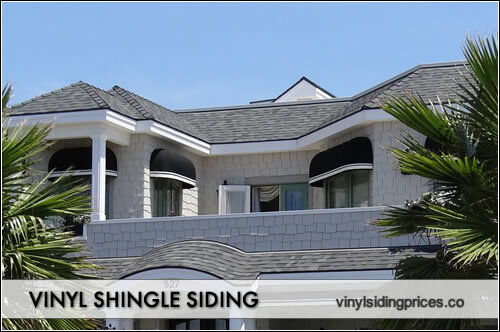 Vinyl shake shingles are roughly four times as expensive as standard vinyl lap panels. One of the major reasons is that they are much thicker and therfore more durable than a horizontal panel. You use more of them so they create a very strong, striaght wall that is difficult to match with an 8 or 12 foot panel board (although the foam backed insulated vinyl boards are very good.) The vinyl shake recreates the rough hewn look of actual wood shake, but obviously in a vinyl material. This is certainly nice for durability and the lack of any maintenance needs. The CertainTeed Impressions Shake offers 8 different options split between vinyl shingles and shakes with different textures and sizes. The Perfection Straight Edge is .100 in thickness and received a 95 out of 100 Consumer Reports vinyl siding. This was the highest rating of any siding product in any category. These products are offered in a wide array of color selections. Vytec Vinyl Shakes takes on the look of rustic shake siding with a rough sawn look, grain and texture. They offer this line in a single 7" profile in either a straight or staggered shingle option. KP Perfection Shingles have a .10 thickness and scored 83 (out of a potential 100) from Consumer Reports magazine. This is the lowest score in the shingle category, although the product is priced significantly lower than its competitors. This product has more of a shake look (rough sawn) than other products in this category. It is available in a single profile and 25 color selections. The Durabuilt 650 series is a specialty shingle panel that incorporates a rustic split cedar design with a nice wood grain texture. The series includes corner post panels that look perfect with the vinyl shake shingles. The 650 comes in 11 accent color options. The Durabuilt 670 series is also a shingle siding that offers rustic craftsmanship and a wood grain finish that is strong and durable. It is available in 11 distinct color selections. As with all projects of this kind, there are a whole host of additional materials that are needed to side or reside a home - these include always include nails, housewrap, fasic, trim, soffit, mounting blocks and starting courses. The amount and scope of the materials needed for any project will dictate the price. Most quality contractors shouldn't have a problem with breaking down the material costs in their bids. Vinyl shake siding prices on the installation will run you $1 to $2.50 per square foot. This is a bit more expensive than lap panels due to the additional pieces that have to be installed. Each of the pieces is light and can be installed by a single installer and therefore doesn't require the extra labor of say fiber cement siding. Lower to middle range projects run $4 to $6 psf installed. These per square foot prices include the vinyl shake, any other needs materials and the labor/installation cost. Mid range to premium priced projects should run somewhere in the range of $6 to $8.50 psf installed. These per square foot prices include the vinyl shake, any other needs materials and the labor/installation cost. There are really no maintenance costs associated with this type of siding. It really shouldn't be painted and simply needs to be washed off periodically to get rid of dany dirt and debris.